Over the last weekend, I visited our great state’s State Fair. By many accounts, it’s the best state fair in the country (take THAT Iowa!). While our family had a blast eating greasy, fried food, hitting the Giant Slide and sitting on virtually every tractor on “Machinery Hill” (my son LOVES tractors), I spent a bit of time observing how companies are positioning themselves and activating their brands at the fair. Each year, one vendor seems to draw my attention–this year it was the good folks at Culligan (last year, I talked about John Deere’s opportunities). Now, this post is not intended to be one of those “throw-the-company-under-the-bus” posts, but instead a larger analysis of a much bigger issue: The irrelevance of company values to external audiences. 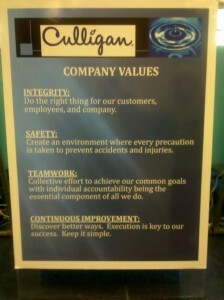 Culligan does a lot of things right at the State Fair. First and foremost, they give away a lot of free water. But as I browsed their booth, one thing immediately stood out for me: They posted their corporate values right in the booth. I’d argue no. Here’s my thinking. I think by posting your “corporate values” publicly, you’re focusing too much attention on your own organization–and not enough on your customers. After all, telling me your corporate values does nothing to solve my problem or need, right? I think customers want to buy from companies that spend 110 percent of their time delivering outstanding customer service–up and down the line. I think customers want to buy from companies who treat their employees the exact same way they treat their VIP customers. I think customers want to buy from companies that are good corporate citizens–those organizations that work hard to make a difference in the communities they support. And none of this has to do with telling me your corporate values. Now, there is a time and a place for corporate values–absolutely. And, more often than not, it’s with employees. But, even with them, your values need to be more than just corporate lip service. Instead of posting these corporate values on your intranet, why not re-double your efforts to live those values and share the resulting stories with your employees, vendors and customers every day? Instead of posting your corporate values on table tents and posters, why not work to better enable, train and support middle management? After all, they are the real core and personality of your organization. Make sure they’re rock stars and you’ll see a much bigger pay-off than just posting values in your cafeteria. Again, none of this is meant as a slam on Culligan. It was merely one example of a larger issue I’ve been meaning to discuss for quite a while. What do you think about posting corporate values (either internally OR externally)? Any value there?